Authorities uncovered more than $3 million in cash inside a small rental van believed to be the proceeds of drug deals across the South. The boxes and large envelopes filled with bills in various denominations were discovered following a traffic stop on Interstate 22 near the Exit 26 ramp area on Tuesday, Sept. 13. 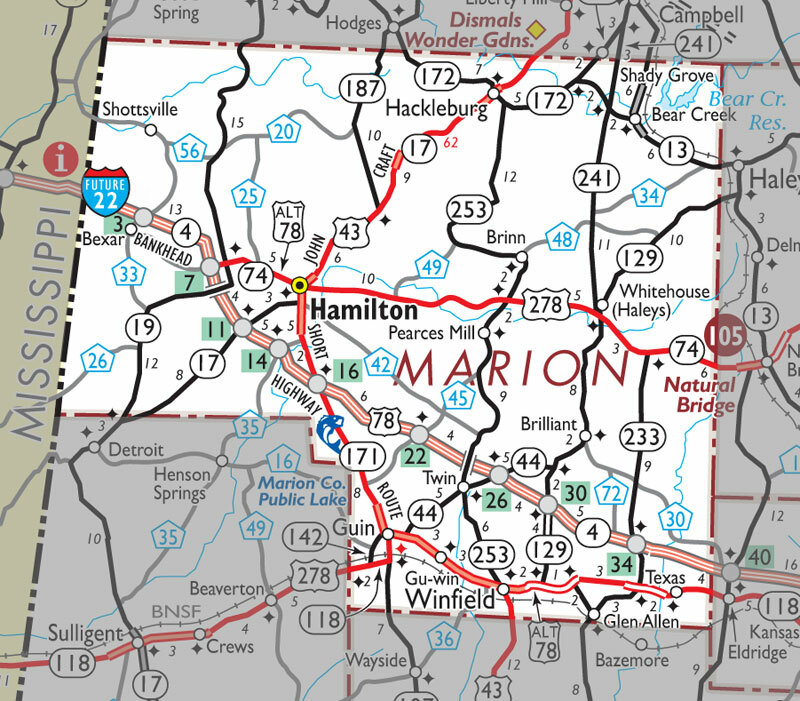 The incident took place at 2:30 p.m. with officers from six law enforcement agencies unpacking the large amount of cash at the Marion County Jail in Hamilton less than two hours later. No drugs were found in the vehicle; however, a handgun was discovered inside a velvet alcohol bag. The rental van is believed to have been returning to California from Atlanta. Arrested in connection with the incident was the driver of the small 2014 Ford van, marked with an “I Ship Express’’ logo. Thomas Shane Randler, 41, Douglasville, has been charged with felon in possession of a firearm. He is known to have four such prior arrests. Authorities have also confirmed the 40 caliber Smith and Wesson had been stolen. Randall was released from the Marion County Jail on a $5,000 bond on Wednesday, Sept. 14. “I can never remember working a case like this one,’’ Marion County Sheriff Kevin Williams said in an interview with the Journal Record less than 24 hours after the arrest. Williams said two officers in Marion County rushed to the Interstate 22 corridor after receiving a tip from an official with the Alabama Law Enforcement Agency (ALEA). Searching the vehicle were Marion County Deputy Damian Allen and Winfield Police Department Drug Investigator Rusty Hulsey. Also found inside the van were a mattress and bicycle, along with four cell phones. The sheriff noted the cash was neatly stacked inside the various boxes packed inside the rear of the van. Williams said a few of the boxes were of the priority mail sort while the remainder were nothing more than plain cardboard boxes. The boxes were numbered in such a manner which may have indicated certain zones, such as G1, G2, G3, and G4, with a few boxes specifically marked Charlotte (N.C.) or Tampa (Fla.). Hulsey and Allen were later joined at the scene by officers from ALEA, SBI, Homeland Security and the Hamilton Police Department, which arrived at the arrest location with its canine unit to further assist with the vehicle search. Additional officers from the sheriff’s department were later called to the scene, as was Marion County District Attorney Jack Bostick. Authorities were on the scene for more than 90 minutes before the cash was transported to the county jail for unpacking, Williams said. Shortly after the discovery, Winfield Police Department Investigator Brett Burleson was asked his feelings upon sorting through such a significant amount of cash. Williams agreed, adding, “It is every officer’s dream to be involved in a bust with this much money,’’ the sheriff said at the jail as the money was being cataloged at the Marion County Jail shortly after the arrest was made. The sheriff said the money was never counted at the site with only each box unpacked with the contents immediately shifted to an evidence bag. The cash was transported to a Birmingham bank the next morning for counting with the eventual storage site being the Homeland Security office in the state’s largest city. The final amount calculated was $3,000,766. Williams said on Thursday, Sept. 15, multiple bank employees, using automated equipment, needed more than six hours to count the cash. “In most cases, the money would have been locked up at the jail, but we do not have the room to store that amount of cash,’’ Williams said. The sheriff said he has been fearful for some time that the Interstate 22 route was being used for the drug trade in the U.S. as the four-lane highway is now a direct link between Memphis, Tenn., and Atlanta. But despite the traffic now being brought to the area by the new interstate highway, Williams said federal and state law enforcement agencies are encouraging rural officers to be even more vigilant than ever as it should be more easy to spot suspicious vehicles here than in metropolitan areas. “We have been told that an out-of-state vehicle like this one will blend in more easily in Birmingham or Atlanta, but that we could spot them more easily as the traffic is smaller in number in our area and more spread out,’’ Williams said. While Williams is busy on the final phases of this case, Bostick is searching for ways to assist with future cases. The district attorney is now pointing to this case to acquire the federal funding necessary to operate a regional task force to combat such drug traffic. Bostick will seek to have this interstate corridor defined as a High Intensity Drug Trafficking Area (HIDTA) in order that federal funding could be secured for such a task force. “This proves what I have been saying for years in our efforts to gain this status,’’ said Bostick in reference to HIDTA designation. Bostick said there is not an interdiction officer currently working this part of the state as it is one of several areas now seeking official designation as a high-traffic drug corridor. The district attorney said those who make the decisions have noted the local judicial circuit should join with others in the area to form a regional task force should funding ever be approved. Bostick said he would be in favor of a plan which would create a region running along the Interstate 22 corridor. The regional task force would serve an area from Marion County to Jefferson County. A portion of the $3,000,766 confiscated during a traffic stop on U.S. Interstate 22 at Exit 26 on Tuesday, Sept. 13, and the specially marked containers. The rented compact 2014 Ford van which was hauling more than $3 million in cash carried an “i Ship Express” logo and an Oklahoma license plate.